This year, from Jan 31 to Feb 6th is the lunar new year holiday in China. And by the old calender, Jan 31 was the new year's day, and Jan 30 was the new year's eve of this year. Recently the person who send and receive the greetings of new year on the social media is rapidly increasing in China as I explained before. Chinese big three social media service, QQ, WeChat, Sina Weibo published the announcement that is related with the new year's greetings as follows. According to the official announcement, there were 13.6 billion messages in Jan 30th on QQ platform. And in a peak time, there were 32.7 million messages in 1 minute, and they also said that there were 16 million video messages in 1 day. According to the official announcement, in a peak time, there were about 10 million messages on WeChat. 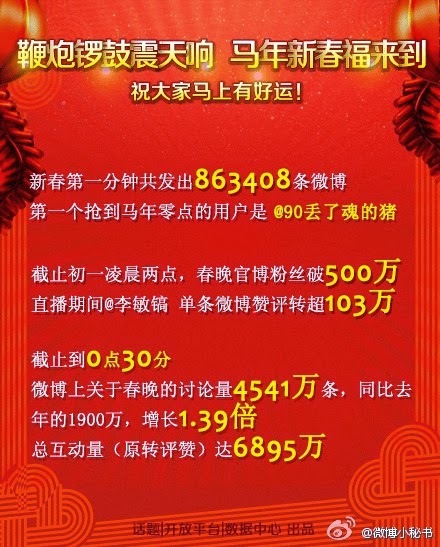 They didn't publish the total message number of Jan 30th, but they said that its total sending message number were double of the last year, and its total receiving message number were three times of the last year. And they also said the peak time of exchanging messages were 22:00 and 24:00 on Jan 30th. According to the official announcement, there were 863,408 messages on the first one minute of Jan 31. They also didn't publish the total messages number, but there were 729,751 message at the same period of the last year, so it can be said its number was increasing. Well, by looking only this result, QQ is the king. And the next is WeChat, and Sina Weibo was far away from them. But this result was based of new year greetings. In general, the new year greetings are exchanged between the family, friends and the acquaintance. I think that the social media services can categorize two types by the point of their characteristic view. Those are "social media service that directed inward" and "social media service that directed outward". Users mainly exchange the personal information between the close relationship in the "social media service that directed inward", and its typical example is Facebook. On the other hand, user would like to spread their information to unknown people such as the purpose of personal branding in the "social media service that directed outward", and its typical example is Twitter. And I think that QQ and WeChat is the "social media service that directed inward", and Sina Weibo is the "social media service that directed outward". So I think that Sina Weibo does not have to be pessimistic about this result. If the standard is different, its result also will be different. But Sina Weibo is recently said that their total users or active users are decreasing. I think, in the peak period of their growth( it is in 2011) , the users who like the "social media service that directed inward" also joined Sina Weibo, because their friend or acquaintance also use Sina Weibo. And recently, mainly such user was gone or stop to use Sina Weibo, I think. So I think that Sina Weibo have to care the users who like the "social media service that directed outward", and at the same time, they have to decide how treat the users who like the "social media service that directed inward". Last, I would like to introduce the status of SMS messages. 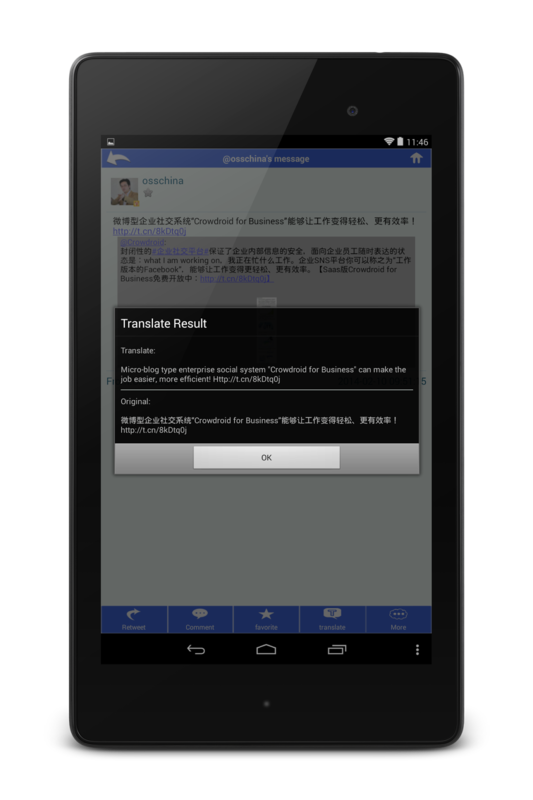 SMS has been the most popular method of exchanging the new year greeting in China for a long time. But as I explained before, its number is recently decreasing year by year. 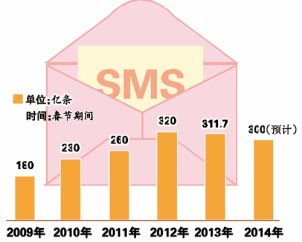 Its number is estimated 30 billion messages during this Chinese new year's holiday, but its number will be decreasing 1.17 billion messages compared with the last year. Mainly almost young people, 80's or 90's, like to use QQ or WeChat when they will sent such greetings, so I think this trend also continue in future. Many users sometimes have the different two intention in their mind, such as "social media service that directed inward" and "social media service that directed outward". When many users get tires of the "social media service that directed inward", then they tend to move to the "social media service that directed outward". And the reverse pattern is also true. Now WeChat is the most powerful social media service in China, and it can be said that WeChat is the "social media service that directed inward". So I think the "social media service that directed outward" may come to the fore as a next trend of WeChat.